To begin with, this cemetery has an amazing name: Pleasures. Of course the name comes from its neighborhood location, but it induces me to a lot of musings about the meaning of life. But what attracts me here? First, it’s flooded with amazing sculptures and beautiful mausoleums. It’s an aristocratic cemetery, the kind where famous sculptors and architects worked for wealthy families graves. 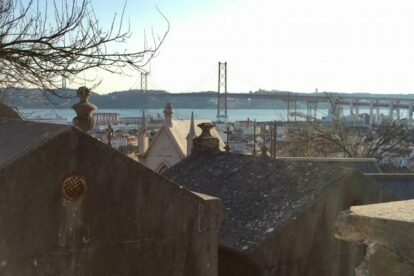 Second, it’s on a hilltop, with a great view over the city, more specifically the Alcantara valley, river Tagus and “25 de Abril” Bridge. And last, I do like visiting cemeteries. They are trabid, but they are also the most peaceful places in any city. When I wander in a cemetery, I am extremely interested in the facts about people and about history written on the tombstones. And since Prazeres cemetery is home for the graves of great Portuguese personalities of culture, art and political history, it’s history everywhere. For instance, here was the place where the poet Fernando Pessoa had been buried for 50 years, before being moved to Jeronimos monastery. Yet his only love during his lifetime, Ofélia Queiroz, is still buried here. Opened in 1833, due to a “cholera morbus” epidemic, it’s surrounded by mysterious signs and symbols, mostly Christian and Masonic. It has the biggest private mausoleum of Europe, of the family Duques de Palmela. Try to get this mausoleum opened, its really an experience. And it’s the biggest and oldest concentration of cypress trees in Iberia. More reasons why I like it so much.